UFA’s Nominations are now open for UFA Board for At-Large Members!If you are an individual or Lifetime members and would like to apply, please visit our website and fill out a nomination form. Deadline for Nominations is Today, Friday, March 1! 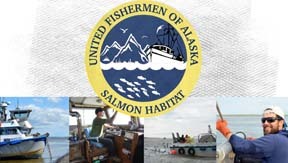 The Board of Fisheries will be holding a public Hatchery Committee meeting in Anchorage on March 8.The deadline for on-time comments has passed, but there is still an opportunity to submit comments to the BOF for consideration on the importance of hatcheries to our state.You may fax comments (up to 10 pages single-sided) to the BOF at 907-465-6094 or you may deliver them 21 copies at the meeting.Don’t have a fax?Use a free online faxing service like Fax Zero. The House Fisheries Committee had a presentation by the Alaska Seafood Marketing Institute’s (ASMI) Interim Executive Director, Jeremy Woodrow, about ASMI itself, a market update, as well as an analysis of the harvest value, volume, and competition in relation to the Alaska seafood industry. Watch Here. Legislative Meetings of interest for this weekend and the week of March 4 – March 8, 2019. Tuesday, March 5, 10 a.m. – 12:00 p.m.
Thursday, March 7, 10 a.m. – 12:00 p.m.
SB 51 – Natl. Res. Water Nomination/Designation (Senate Resources – UFA Supports) Currently in Senate Resources with no scheduled hearings at this time.